Spire, makers of the wearable tracker to bring you inner calm, is back with a clip-on sensor that wants to help you sleep better, de-stress and monitor your daily activity. 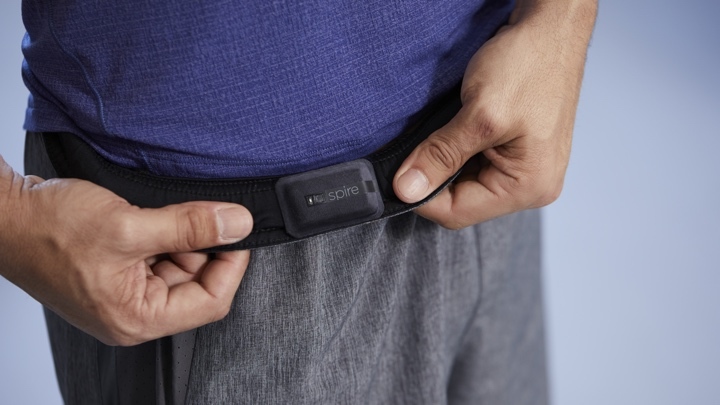 Unlike previous Spire wearables, the Health Tag comes in packs of 3, 8 and 15 and can be stuck directly onto clothes whether that's a bra or your gym gear. With a two-year long battery life, the Tags are waterproof and will also survive a spin in the wash if you forget to take clip them back off. The Stress Test: Can a wearable actually make you calmer? Packed inside these Tags are a range of sensors that are able to monitor breathing patterns, physical activity (using heart rate) and sleep quality. If the Tag notices that something isn't quite right whether that's feeling particularly stressed or you're not getting enough sleep, it'll offer up personalised recommendations in real-time. So it could tell you take a deep breath while you are sitting in traffic or suggest cutting back on an evening workout to improve your sleep. The hope is that these small recommendations throughout the day can help improve your overall health and wellbeing. "We created Spire Health Tag with the belief that the health wearable should be completely invisible unless it has something important to tell you in-the-moment. Only by making the wearable disappear can the industry drive better outcomes," said Jonathan Palley, co-founder and CEO of Spire. The Spire Health Tag is available no from Spire's website with prices starting at $99 for the 3-pack option. That rises to $199 for the 8-pack and $299 for the 15-pack. We didn't exactly have the best of experiences with Spire's last generation wearable, so here's hoping things have greatly improved if it's going to have any chance of winning us over with its wellness skills.